Photograph of members of the Jewish student union in Heidelberg, Germany. The group was established in 1945 with most members arriving directly from the camps. All were survivors. They became physicians, dentists and economist (world famous) and mathematicians. A remarkable group of people - they are dispersed all over the world: In Israel, the U.S. and in Austraila. 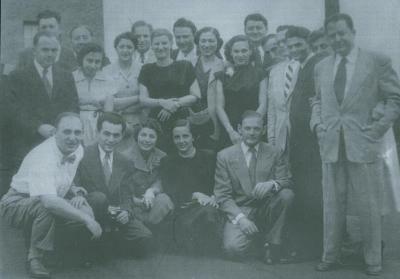 Sitting: Paul Ornstein (second from left) and Anna Ornstein (fourth from left).